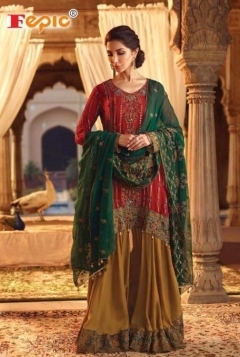 Wholesale Designer Salwar kameez Design Catalogs. Designer salwar kameez is the most recent trend amongst girls and everyone wants you. For the modern girls salwar kameez must of the latest fashion & latest trend. So, designer salwar kameez is the best choice to the that sort of girls. For wholesale designer salwar kameez shopping, Visit Sanvari Fashion! We've got a massive assortment of the very most recent designs, all richly enchanced and solidly tailored. We're the major manufacturers of cultural wear. Our salwar kameez is of very superior quality as it's been designed using only the highest quality raw materials procured from famous and renowned traders. Each of the Bollywood stars are wearing salwar kameez at any occasion or another. We keep upgrading our assortment to home the very latest inventions. Bollywood actress & small screen actress have become the major designer salwar kameez outfits to the common ladies in India. Alia in Badrinath ki dulhania & Jahnavi Kapoor in Dhadak are promoting the designer salwar suits in their movies. Get Wholesale designer salwar kameez online at Sanvari Fashion. Hurry, we're the most favourite! Wholesale Salwar Kameez Catalog at Sanvari Fashion. Sanvari Fashion is the leading producer and supplier of Wholesale Designer salwar kameez at cheap price in Surat, India. The broad range of Designs, patterns, Catalogs for you to choose the one’s of your own choice. Latest & finest quality of wholesale designer salwar kameez is available in Sanvari fashion. The major motto of the Sanvari Fashion is that the customer are to be happy in shopping with us. There are professional designers in our store. We also provide the delivery services to all the major cities & all over India. We also deliver to foreign countries such as US, UK, Canada, London etc, & around the globe. We also have the fast delivery services so that we deliver within the 24 hours of the orders placed. So make the lot out of wholesale Designer Salwar Kameez at Sanvari Fashion. Visit Sanvari Fashion and enjoy your shopping with us.